In our previous tutorial, we have learnt How to Interface a 16*2 LCD with PIC Microcontroller. We recommend you to go through it before going any further, if you are beginner in PIC microcontroller. Previously we have also learnt the basics of PIC using LED blinking Program and Timers in PIC Microcontroller. You can check here all the tutorials on Learning PIC Microcontrollers using MPLABX and XC8 compiler. In this tutorial, let us make it more interesting by creating our own custom characters and displaying them on our LCD screen using PIC16F877A PIC Microcontroller. Also there are some pre-defined mostly used custom characters given by the HD44780A IC itself, we will also see how we can use them. 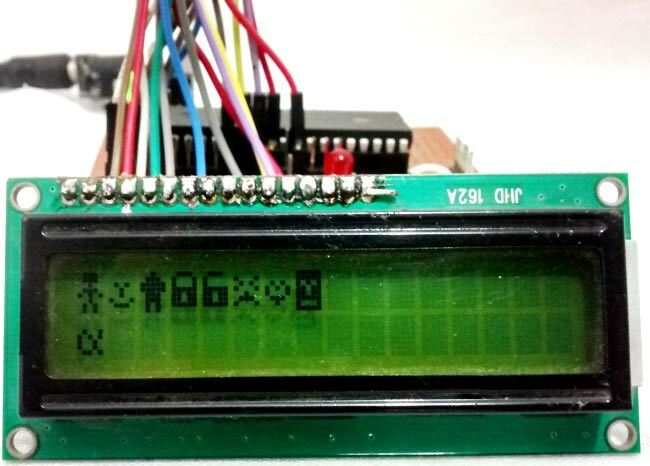 As explained in our previous tutorial our LCD has a Hitachi HD44780 controller embedded on it which helps us to display characters. Each character that we display is already pre-defined inside the ROM of the HD44780 IC. We will learn about LCD controller IC HD44780, before displaying character on LCD. Character Generator ROM (CGROM): It is the read only memory which, as said earlier, contains all the patterns of the characters pre-defined inside it. This ROM will vary from each type of Interface IC, and some might have some pre-defined custom character with them. Character generator RAM (CGRAM): This is also a Random access memory, so we can write and read data from it. As the name implies this memory will be the one which can used to generate the custom character. We have to form a pattern for the character and write it in the CGRAM, this pattern can be read and displayed on the Screen when required. Now, since we got a basic understanding of the types of Memory present in the HD44780 interface IC. Let us take a look into its datasheet to understand a bit more. As, the datasheet implies, the HD44780 IC has provided as 8 Locations to store our custom patterns in CGRAM, also on the right we can see that there are some pre-defined characters which can also be displayed on our LCD Screen. Let us see how we can do it. To display a custom character we must first generate a pattern for it and then save it to the CGRAM. Since we have the library functions with us already, it should be easy to do this with some simple commands. Here is the Library for LCD functions, but here we have copy-pasted all the Library functions in the program itself, so no need to include this header file in our program. Also check this article for Basic LCD working and its Pinouts. The first step is to generate a pattern or the custom character. As we know each character is a combination of 5*8 dots. We have to select which dot (pixel) should go high and which should stay low. Simply draw a box like below and shade the regions based on your character. My character here is a stick man (hope it looks like one). Once shaded, simple write the equivalent binary value of each byte as shown below. Simply put a ‘1’ on the shaded region and a ‘0’ on the un-shaded region for each byte, and that is it our custom pattern is ready. Similarly I have made 8 custom pattern codes for our 8 memory spaces present it the CGROM. They are listed in the table below. Note: It is not mandatory to load all the 8 spaces provided in the CGRAM. Here, inside the ‘for loop’ each binary value is loaded into the CGROM. Once the pattern is loaded, the custom characters can be made to display by simply calling the location of the pattern using the void Lcd_Print_Char(char data) function as shown below. The HD44780 IC has some predefined special characters stored in the DDROM. These characters can be directly printed on to the screen by referring to its binary value in the datasheet. For example: The binary value of the character "ALPHA" is 0b11100000. How to obtain this can be understood from the figure below, likewise you can get value for any special character which is pre-defined in the IC. The complete code of this project is given below in Code section, also check the detail Video explanation at the end of this tutorial. This project does not have any additional hardware requirement, we have simply used the same connections from the previous LCD interfacing tutorial and used the same board which we have created in LED blinking Tutorial. As always let’s simulate the program using Proteus to verify our output. So that’s how you can Display any Custom Character on 16x2 LCD using PIC Microcontroller with MPLABX and XC8 compiler. Also check our complete PIC Microcontroller Learning Series here. //LCD Functions Developed by Circuit Digest. Hi, could you upload the proteus project for download it? Thanks anyway.